As the afternoon wears on, I turn out of Agate Fossil Bed National Monument near Harrison, Nebraska. Tumbleweeds the size of boulders streak past in all directions causing me to involuntarily close my eyes and make darts to the left or right behind the safety of the windshield. One sticks on the hood ornament and I lurch back with enough force to strike the head rest and then bounce back to an upright position. My motions would appear silly to anyone watching, but there isn’t anyone. After a seven-mile, GPS-guided journey, a turn west is made onto another gravel road. The similarities end abruptly as it narrows to something fit more for an ATV. Rescuing my head from the roof means pulling back on the gas until the truck slows to 20 mph. The GPS indicates 14 miles before the next turn. Fourteen miles has never seemed this far! My head turns on a swivel, revealing my position on a thin, elevated ridge at the top of a butte. 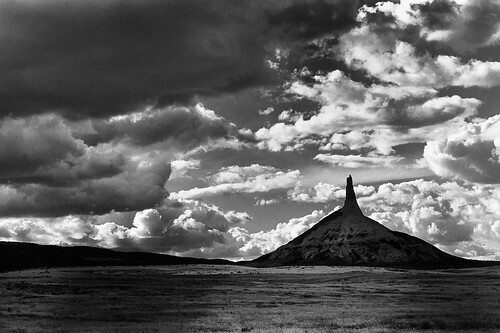 The view is a sweeping-wide expanse of Nebraska high country. I’m in a bowl of sorts and around the rim rises taller buttes, their sides striped with millennium of mineral and rock deposits. 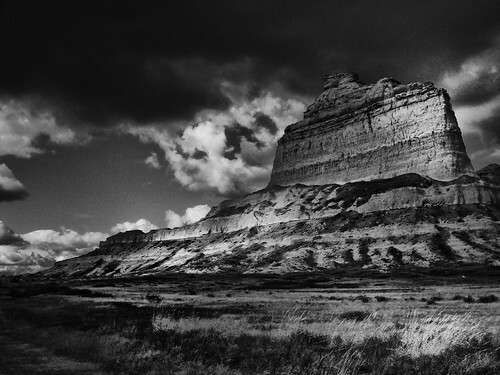 As the truck slips by my side mirrors stage a scene of crumbling rock and scree down the buttes ancient, steep sides. I’m lost. Being raised on a ranch with broad expanses of land, my Dad taught us to stay cognizant of high line wires, one of the many survival skills he taught. And one of the few that stuck. He said high line wires signal civilization and told us to follow them if we ever became lost in the woods. Only I’ve not seen a high line wire for the four miles from the last turn and can’t see any now. I’m not on the map, have no cell service and no idea where this road is headed. It’s getting late and with large storm clouds gathering, the sun tucks behind a low, dark cloud. I rip the sunglasses off my face. There’s a real situation brewing and my only concern is how to get out of the truck and photograph what surely has never been photographed. Stopping the truck to check if there’s enough clearance to safely maneuver around the sides, a humorous thought hits. I’m in prime Indian country. The desolate buttes and high country prairie are studded with large boulder outcroppings, perfect positions for lurking and pouncing. I’m convinced despite the fact I’m driving a late model truck with 4-wheel drive, 8 cylinders and more horses than their entire tribe lays claim to, they could disable it. How would I manage to change a flat tire from one of their perfectly launched arrows in the dark with a howling wind and pounding rain? This imaginative scene is thrilling but a switch is thrown, and my self-entertainment transitions to… well I can’t say “panic”. More like a sobering stab of “I really need to get the hell out of here.” I turn around, which takes some time as the truck is bus-like, the road tiny-like. Finally, driving hunched over the wheel, I backtrack to the Agate Fossil Beds, where the wrong turn becomes belatedly obvious. I’ve just experienced the slightest degree of fear! This very emotion is one of the reasons I yearn for these trips – a little fear and doubt definitely prod the joy out of being alive. I dislike fear in the moment, but savor it, linger over it later in the comfort of safety. For now, concentration is required in order to locate lodging before dark. As much as I’d like my day to end with the adrenaline rush intact and a good meal, there’s driving to do. The combination of season shortened days and the anticipation of the endless possibilities dawn brings, has transformed me into a morning person this trip. Only my family can say how truly monumental a phenomenon this is. Having risen early, I’ve been on the road for 10 hours. My initial misgivings about this road trip prompted me to purchase a book on tape just in case the whirring of tires on pavement didn’t suit me. It hadn’t for the better part of today. Narrated by the author, the story is excellent, the tale engrossing. Pressing <Play>, it resumes. The excitement of being lost receding, with the serenity I love so much about the open road returning, a racket that can only be the cassette player devouring the slick, thin tape begins. Fumbling with the buttons on the player, the truck tops a hill and there it is. As far to the East as the light extends, the magic of the setting sun has turned fields of brown, drab winter grass to gold. Not simply GOLDEN but the deepest, most glorious saturation of the color I’ve ever seen. The clouds that have done their part all day to hamper my mood are now indigo and pink, low on the horizon stretching towards the clear, azure center like one of those open domed sports arenas I’ve read about. I imagine them having strived all day to separate themselves from the drab prairie beneath, but now are gladly dipping and dancing in an effort to touch the glory on the ground. Pulling the truck well off the road maintaining its nose northward, I recognize not another vehicle has passed in either direction in quite some time. The scene before me is for my eyes only. Moments like those. No wealth in the world can make you feel special enough to be given gifts like that. The moment is frozen in my imagination. Your description absolutely feeds my mind, and even though I was not there, I feel as though I have been at some time, as though I, too, experienced this moment, by myself. Never tire of discovering this kind of moment. Even through the eyes of another. This photo and the moment are wonderful. Your description captures my imagination.